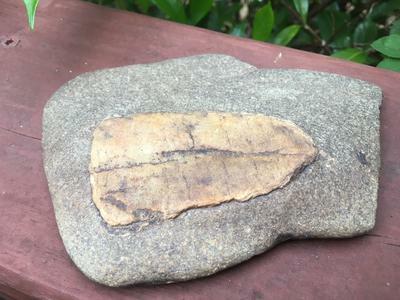 I found this specimen in the Nottely River, near Blairsville, Georgia this weekend. It has been in the water for a long time and the fossil is somewhat water eroded. The stone appears to be a broken Amerind axe head, probably from the Woodlands period. Can you identify the fossil from the pics? I am not familiar with this area, but from geology maps there should be no fossil bearing rock here. Having said that if this is an axe head it could have come from far away. My guess is that this is a leaf fossil. It has a veining pattern and shape for it.